YOUNG PULP COMES TO AUDIO! THE ADVENTURES OF PEABODY RICH NOW AVAILABLE! Pro Se Productions proudly announces the release of THE ADVENTURES OF PEABODY RICH as a top quality audiobook produced by Radio Archives! Peabody Rich is a boy with an unusual problem; he remembers everything he sees. When his mentor is attacked on the Wartley University campus near Washington, D.C., Peabody and his friends are unknowingly put in danger. With their parents out of the country on business and their sitter in jail for attempted murder, Peabody and his friends must use his “gifts” to unravel a clue and find his mentor’s attackers. They must avoid the police finding out they are on their own, outsmart school and museum officials, and outrun thugs in a high speed chase through Washington, D.C. to get to the bottom of what’s been going on at Wartley University. Little do they know that while they are hunting for answers, Tobias is hunting for them. 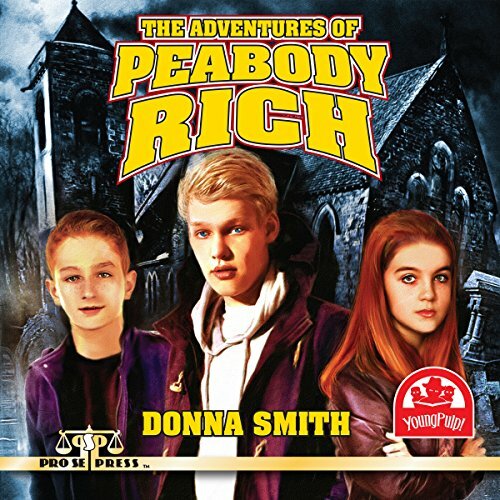 THE ADVENTURES OF PEABODY RICH by Donna Smith is a part of Pro Se Productions YoungPulp! imprint. Aimed at introducing younger audiences to the style of Pulp Fiction while providing them with engaging tales, YoungPulp! features stories from all genres written both appropriately and intelligently for Young Readers to discover, enjoy, and explore! Remember everything as You join THE ADVENTURES OF PEABODY RICH! From Pro Se Productions. THE ADVENTURES OF PEABODY RICH is available at Amazon and www.prose-press.com. FINAL ADVENTURE OF BARRY REESE’S DARK GENTLEMAN NOW AVAILABLE FOR ONLY 99 CENTS!